Engines and Transmissions - Atlantic Used Truck & Salvage Corp. Engines and Transmissions - Atlantic Used Truck & Salvage Corp. Engines and Transmissions - Atlantic Used Truck & Salvage Corp.
Engine or transmission failure is always bad news. Not only is it a major inconvenience to lose your daily transportation but you now have to determine what is the most cost-effective way to get yourself back on the road. Once you determine how much it will cost to fix the problem, you need to decide if it makes financial sense to invest that amount of money in your vehicle. If the cost to repair, rebuild or replace the engine or transmission is more than the vehicle’s resale value, the investment may not be worth it. But if your vehicle is in good condition otherwise, one of the most common (and cost-effective) solutions is to replace the failed engine or transmission with a used / recycled unit. After considering your options, if it makes financial sense to replace the failed engine or transmission your next step is to find an affordable, reliable source for the part. This is where we can help. 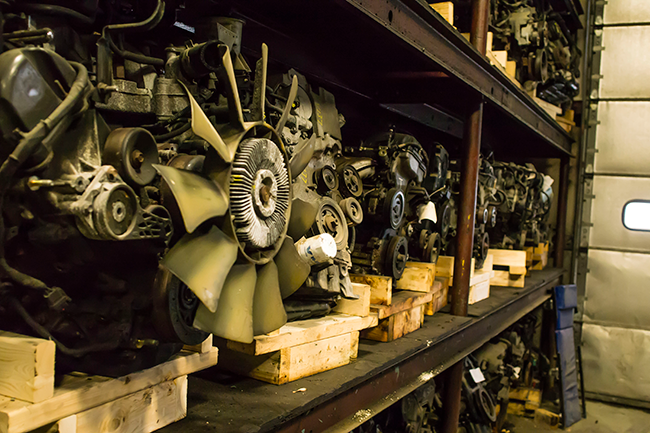 Operating from our salvage yard in Lowell, MA, Atlantic Auto Salvage has been a top supplier of used auto parts for nearly 40 years. We have a large inventory of drive train parts for all typical American & foreign made cars, pick up trucks, mini vans and SUVs. We offer a standard 90 day warranty on all drive train parts (optional extended 6 month & 1 year warranties are available). Local deliveries are always free. Interstate shipping can be arranged. You can search for engines, transmissions and other drive train parts on our website or you can call our sales department at 800-225-0812 / 978-459-2544 for more details.